Goal of the design was an Embedded Computer for the Extreme, that is ultra compact, robust, and completely fanless. With the Z520PT processor and the US15WPT chipset, we built a compact passive cooled system, that works smooth between -40°C and +85°C, without derating or throttling, and no fan or case openings. Integrated are features like up to 4 Gbit Ethernet ports, 7 USB ports, and 2 serial ports. Extended temperature DDR2 memory modules up to 2GB can be used. The unique design allows the system to be used in any application, regardless how rugged the environment might be. 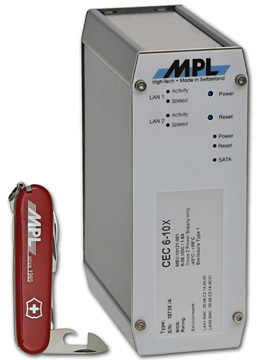 CEC6-X systems are 100% PC/AT compatible, therefore any PC operating system (Windows, LINUX,..) can be used. Graphics, 4x Gigabit Ethernet, 7x USB2.0, 2 x PS/2, 2x SERIF ports (interfaces on top and bottom side).